Incidents mentioned in the Vedic literatures, such as the Puranas, Mahabharata and Ramayana are factual historical narrations that took place sometime in the past, although not in any chronological order. Such historical facts, being instructive for ordinary men, were assorted without chronological reference. Besides that, they happen on different planets, nay, in different universes, and thus the description of the narrations is sometimes measured by three dimensions. We are simply concerned with the instructive lessons of such incidents, even though they are not in order by our limited range of understanding. Bhismadeva described such narrations before Maharaja Yudhisthira in reply to his different questions. Also, such tattva-darshis are also knowers of the past-present and future. Thus, if a future personality is included in some list, then this property of tri-kala-jna explains how it is possible. In Srimad-Bhagavatam you will find many things which are foretold. There is mention of Lord Buddha’s appearance and Lord Kalki’s appearance. (Lord Kalki will appear at the end of the Kali-yuga.) There is also mention of Lord Caitanya’s appearance. 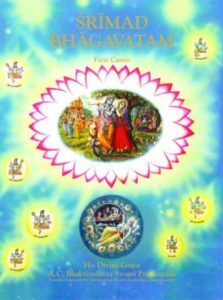 Although the Bhagavatam was written five thousand years ago, the writer knew past, present, and future (tri-kala-jna), and thus he could predict all these events with perfect accuracy. This Bhagavata-grantha, sastra, was written five thousand years ago. Now five thousand years ago there was no Buddha. But in future he will come, and that is mentioned here: bhavisyati. Not only Buddha’s name only, but his mother’s name and the place where he would appear. This is called sastra. No speculation. Fact. Either past, present or future, it doesn’t matter. Tri-kala-jna. So we accept knowledge from such person who knows past, present and future. Persons who do not know even present what is going on, how we can accept knowledge from him? This is not our process. Our process is to receive knowledge from a person who knows past, present and future. Just like Krsna and the acaryas. They know. So our knowledge is perfect because we are receiving knowledge from the perfect, as it is. Therefore our knowledge… It is not that I am perfect. I may not be perfect; I may be perfect. But because I am accepting the perfect knowledge, therefore whatever I speak on that basis, that is perfect. This is our process.